Yes teaching and mentoring are fortes for Gamache but he has to keep his hand in active investigating too. Teaching integrated with work is actually different to teaching in a college type environment. While I think he could do either I wonder if he wouldn’t prefer the former. I don’t want Gamache to go too far but Louise does love Island time so maybe he could do a short trip away with work. That would be a book like Beautiful Mystery, a more isolated environment. Like Julie, I would like to see something for Reine-Marie. She adapts so well to any situation but she is an intelligent woman capable of so much. She deserves an opportunity to doc that and her skills are so valuable for investigations. Mmmm….what job might she do that could give her access to information Gamache might need? I thought Ruth was softer in this novel, well fewer sharp edges. I can’t see her changing too much more. The villagers wouldn’t cope. They need Ruth as a foil for their jokes! Now people! I have a need. I need creative discussion flowing here in the Bistro as it inspires me greatly. I have picking at the edges of my second book and it only took off this week when I finally got around to hearing Louise’s interview on the book tour. I set myself a lofty target of words per day and I almost made it five days straight. I am a few hundred short tonight so I need your help to keep going! Anyone have any questions about TNOTB? Insights? Rages? It’s a great book. I know I should have made more notes when I read it. I did highlight a couple of things, handy Kindle function as I couldn’t do that to the real book. When Gamache is talking to Myrna about the Soecial Handling Unit he asks why she didn’t do any counseling there. She responds that the prisoners in the SHU are too damaged and she felt her failing was that she couldn’t help them. In light of previous discussions on the nature of evil, the beast as it were, does Gamache’s statement imply that evil is born not made? What else do you take from it? Okay- I need more coffee – I had to start three times and all I got out was spoiler alert! Anna, I think that there are some (a few) who you could say are not damaged, though certainly not the whole population of a place like the SHU… John Fleming is a pure sociopath, and I firmly believe that those are the ones born and not made. Those with absolutely no empathy. Just like there are birth defects you can see, there are some you can’t see. But your general, run-of-the-mill criminal, including most murderers (at least those that Gamache has been dealing with the last years) were not born that way – something or someone damaged them. But sometimes, the damage can be so great that there is nothing to be done. Myrna, I think, is one who felt her patients’ pain so deeply that finally, she couldn’t continue. She needed, not just to rest, but to help the world in a different way now. She does that by bringing books to the people of Three Pines, by being a wonderful friend and by helping Gamache. In the last few books (not this one so much), she has helped Gamache quite a bit in his cases. Like you, Anna, I agree that Gamache needs to do something that allows him to be involved in cases, but I really don’t want to see him still involved in all homicide cases. I hadn’t thought of a one-off kind of thing for Haiti – that could be very cool. In fact, maybe he could stay in Three Pines and be a consultant for the UN, and every once in awhile, he could be called to a place for help. Sometimes, Jean-Guy and Isobel could assist. Three Pines isn’t THAT far from New York, where the UN is headquartered. I’d love to see something set there, too. New York is my favorite real place (Three Pines being my favorite imaginary place). Gamache’s remark, “Maybe some can’t be repaired because they were never damaged” leads to more than one line of thought. I find it very hard to accept that some people are born monsters. As if, they were born dammed with no hope of redemption. That doesn’t seem just. Much in this life is not just though…birth defects, physical and mental, children born into horrible situations, some people who have wretched lives through no fault of their own, etc. I know that even some forms of Christianity now teach that people should not say “Christ Died for All” because salvation is not available to all – only those chosen. Don’t mean to get ‘preachy’, but such thoughts are very weighty. It does seem though, that some people are just evil. It seems to me, some people choose to be evil, not because they are unable to not be evil, not because they were damaged but because they just wanted to. I know the next question is “Why do they want to ?” I wish I could be more logical but I can’t. I want to discuss Gamache’s and Reine-Marie’s future but I need an iced coffee, now. Excellent thoughts Julie and Barbara! I was thinking about sociopathy whe I read that too Julie. I wonder if sociopaths see themselves as defective. If you have never had strong emotional attachments such things might feel like a waste of energy. Of course there are successful sociopaths, business and politics are often where they make their mark because studies have shown that they react to money and its acquisition. If we accept that sociopathy per se is not evil But that psychopathy might be then why do some choose to do evil things? Boredom perhaps. A desire to test the limits of their lack of feeling? Actually, they must get something out it because something reinforces the behaviour. What might Fleming seek? He certainly likes to induce fear and discomfort in others. Barbara, you expressed an important point, evil is a choice. Do you think that is what Gamache meant? No matter whether they born sociopathic or not they weren’t necessarily damaged or hurt to become as they were but they chose it. In that case someone like Myrna would have little to offer in the way of help if they had simply wanted to be what they are and do what they do with a clear ability to reason and a knowledge of society’s mores, then what can you say? Thank goodness Myrna didn’t go into the SHU. She is so sensitive, it would have had the potential to hurt her beyond repair. it would seem that being damaged is not a required precursor for being evil. So many of those in Three Pines are damaged but it has let the light in, provided their goodness a chance to grow. A consultancy job might be just the flexible ticket for Gamache for a while. I have never been to New York Julie but wouldn’t that be a great venue for a novel. My husband has and my daughter is there right now and seems to be loving it. She isn’t good about providing detail so I sent her a fill in the blanks email with suggested words in brackets….The things I love in NY ( list what you have enjoyed seeing) because (expand on why you those things)……and yet still nothing. I guess she really is having too good a time to tell me about it. Sigh. I have been enjoying following everyone’s thoughts, fascinating. I appreciate that Louise threw these ideas out for us to contemplate. It will, indeed, be interesting to see where they lead in the next book(s). Anna, of course, copyright laws. I’m so glad that you are getting a map from Julie. Brilliant! Millie, thanks for your concern. Yes, caregiving has taken an upturn, my mom’s needs have expanded for the time. Things may be better in a few weeks. I’m a little shut down mentally at the moment, trying to focus and successfully complete what is needed each day. I always check the Bistro and Louise’s post each day. Her story about Michael reaching out to try to button her sweater has given me many smiles. Anna, I admire your attempts to elicit info from your daughter, but you know it will come. Hard to wait, though. New York! What a thrill for her. Julie, I love your dress and the fabric. So beautiful and it does look delicious to wear! Barbara, glad you got the book and liked it so much. I am remembering your reminders to take care of my health and, for one thing, I’m making myself go early to bed. No more late nights in the Bistro for now! So lovely to hear from you Cathryne!!! Sorry to hear that the demands of caring have increased. Big hugs from me. It can be so draining that there are times when I have no idea how to frame a sentence so kudos to you for dropping us a line and letting us know how you are. Do get rest when you can. My husband says sleep is a weapon. He means it is important. And it is. Eat well when you can and be kind to yourself. Despite what I just said, if you need to collapse on the couch and eat handfuls of chocolate…go ahead. Remember if you can’t sleep I am usually awake while everyone is asleep so there is usually at least one sympathetic ear monitoring the Bistro. In the meantime, sit a while by the fire with a hot chocolate or a glass of something stronger and just breathe. We sat at a little table for two on a raised platform, and right in front of the center of the dance floor. There was quite a large band playing ballroom music, and people were dancing! 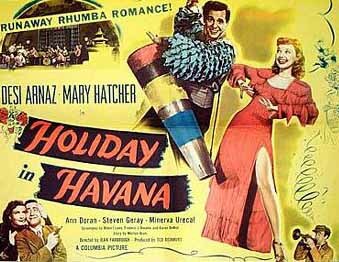 After awhile, a man in big shirt with large frilly sleeves – like this – http://www.bigbandlibrary.com/desiarnazholidayinhavanalobbycard.jpeg – came in and sat down at the piano and took over for the piano-player, who left. Then another came and replaced the guitar player, and another took over for the trumpet player, etc., etc. By the end of the song, which had continued uninterrupted, everyone had been replaced, and the new bandleader came in and they played latin songs for a set, then the same routine as the ballroom band came back. They did this all night, so there was never a time without live music to dance to. It was just as it should be. We had dinner, but you didn’t need to – some people seemed to be regulars who came in just to dance and nurse a drink, and nobody seemed to mind. Anna – just sent through a long post about one of my experiences in New York, with links to pictures of the Rainbow Room, and it is now “awaiting moderation”, so I guess it might not make it if it turns out those links are to copyrighted pictures or something. So, I’m copying the post and if it doesn’t make it through, I’ll post again without the pics. Hopefully, though, since the pics are already up on the internet, it will be okay. Cathryne – so glad you are able to take a little time for respite in the Bistro. I second what everyone is saying about making sure you get enough rest, and eating well. I’m so sorry that your mom’s health is requiring so much from you right now, but hopefully, things will get better, and you can come in and comment some on the discussions. Til then, just know we’re here, rooting for you and for her. Thank you for your NY tales! I appreciate hearing all about it. Yep, another place on my wish list! Once again all you ladies have provided excellent food for fodder! I too feel that we will be seeing some of these characters again, unfortunately I think John Flemming will be one of them; remember when Adam Cohen confesses he made a mistake and Armand acknowledges it? I feel this is somehow a lead in to another encounter between Armand and Flemming. On a lighter note, don’t you love how Louise has infused the book with the bountiful harvest of apples? I need her humor to get me thru the dark episodes! I couldn’t agree more Amy. I felt a bit ill with anxiety when I read that Adam had given away information. Not a good idea at all. Fleming is a fabulous character. We see him ever so briefly but he has had a profound effect. He is more three dimensional to me than Rosenblatt or the agents (whose names I have forgotten momentarily, don’t worry Louise it’s not your writing but my memory, I forget my own characters names at times). Perhaps because he has evil he casts a shadow that gives him more depth. Isn’t it interesting how Rosenblatt tries to run down the intelligence and capabilities of Fraser and Delorme (I didn’t remeber, I looked it up….there is no shame in that :-) ). Nobody is telling the truth, the whole truth and nothing but the truth in that crowd! And don’t you love how Gamache is reading TKAM, a nice nod to Harper Lee I thought. I wonder if Louise read GSAW? Cathryne: So good to see you pop in and say hi. I do hope you are able to get someone to give you a bit of ‘time off’ from caregiver duty. My mom couldn’t because, unlike Louise’s Michael, dad was paranoid of anyone he didn’t know… The emotional demands can be more exhausting than the physical. Rest all you can. Big hug from me to you.